It is best to search with the Sage Journals Available to me setting turned on. Otherwise you will be shown articles that are not available for free. Each of the two search boxes has pull-down menu to the right of it. Keyword - do not use this option! It is not a normal keyword search. Sage Journals does not have a Controlled Vocabulary search option. Pull-down menus to the left of the search boxes allow you to join the search boxes with AND, OR or NOT. Put quotation marks around any search phrase or exact combination of keywords (e.g. ; "United States of America" or "social psychology"). Use AND between two keywords or phrases to search for articles containing both terms. (e.g. ; Sumatra and tsunami). Use OR between keywords to search for articles containing either term (e.g. ; teaching or pedagogy). For more information about keyword searching with Boolean Operators, see Using AND, OR & NOT to Combine Keywords. 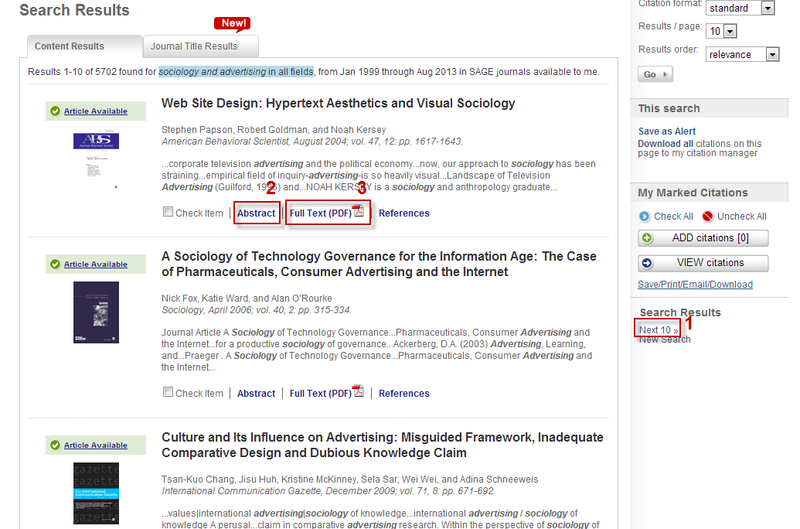 By default, EBSCOhost puts an AND in between the search boxes. You can use the pull-down menus to to change it. Boolean-savvy users: EBSCOhost treats each search box like a giant set of parentheses. Unless you are ok with getting search results that are not available in full-text, you should go to Search Within and click Sage Journals Available To Me. You can limit your search to articles that were published within a certain date range. Sage's search results list is organized differently from most other databases. If you have more than 10 search results, you will have multiple pages to go through. The Next Page link is in the column on the right side of the search results list. To view Article Information, click the Abstract link underneath the search result you want. To view the full-text article, click the Full Text (PDF) link underneath the search result you want. Once you have clicked on Abstract, you will be taken to the Article Information page. The title and author(s) of the article are featured prominently at the top of the main column. The journal title, volume, issue, and pages are immediately to the right of the title and authors. Right under the title and authors is the abstract, which is a summary of the article's content. 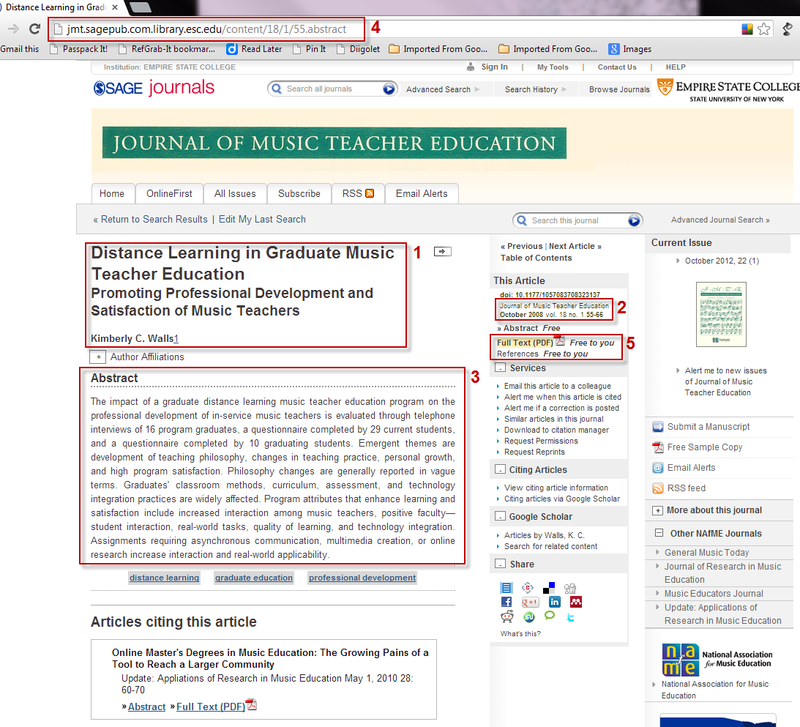 Sage Journals is one of the databases where the permalink to the article is the same as the URL in the address bar of your browser. If you want to link directly to the article, just copy and paste the URL from your browser's address bar. A link to full-text is to the right of the article title, author, and abstract.